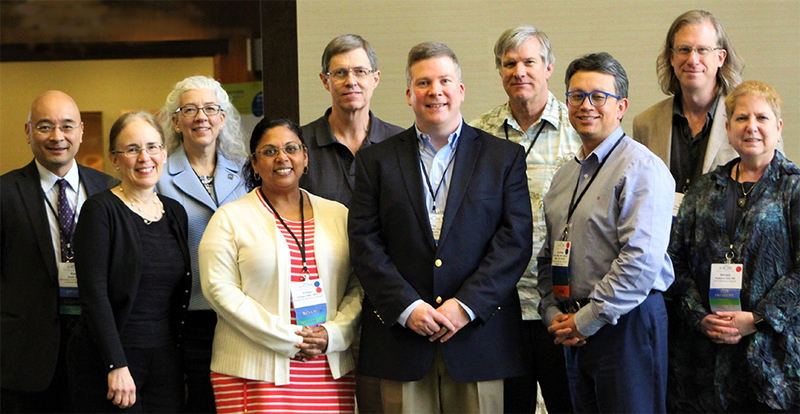 Pictured above left to right, Kentaro Ikeda, Lauren Patton, Carol Anne Murdoch-Kinch, Vidya Sanakr, Craig Hatch, Eric Stoopler, Michaell Huber, Andres Pinto, Nathaniel Treister, and Miriam Robbins. AAOM's Executive Committee is made up of its elected officers and two most recent past presidents. The Executive Committee takes charge of the general decision-making necessary to run the programs of the Academy on a day-to-day basis. The E.C. is responsible for implementing the Academy's strategic plan and for executing the will of the Board of Trustees. Dr. Stoopler is a Professor of Oral Medicine and Director of Oral Medicine Education at the University of Pennsylvania School of Dental Medicine. He completed his undergraduate studies at S.U.N.Y Binghamton and earned his dental degree from Penn Dental Medicine. Dr. Stoopler completed a General Practice Residency at the Brooklyn V.A.M.C. and a Fellowship in Oral Medicine at Penn Dental Medicine. Dr. Stoopler holds Fellowship in The American Association of Hospital Dentists, The International College of Dentists, The Royal College of Surgeons (Edinburgh, England), The Royal College of Physicians and Surgeons (Glasgow) and is a Diplomate of The American Board of Oral Medicine and The American Board of Special Care Dentistry. He maintains an active oral medicine practice at the University of Pennsylvania Health System and is a Consultant to the Children's Hospital of Philadelphia. Dr. Stoopler received the University of Pennsylvania's Christian R. and Mary F. Lindback Foundation Award for Distinguished Teaching and is a member of Penn Medicine's Academy of Master Clinicians. He is a contributing author to Burket's Oral Medicine, the American Dental Association Guide to Dental Therapeutics and has served as Editor of the Medical and Dental Clinics of North America. Miriam R. Robbins, DDS, MS is the Chair of the Department of Dental Medicine at NYU Winthrop Hospital in Mineola, NY. She is a clinical associate professor in the Department of Oral-Maxillofacial Pathology, Radiology and Medicine at NYU College of Dentistry, where she was previously the Associate Chair of that department as well as the Director of Special Needs Dental Clinic. She received her dental degree from SUNY at Buffalo School of Dental Medicine and her MS in Management and Health Policy from the Robert Wagner School of Public Policy at NYU. She completed her residency at Columbia Presbyterian Medical Center and an American Cancer fellowship at Memorial Sloan-Kettering Cancer Center, both in New York City. She is a Diplomat of the American Board of Special Care Dentistry and holds Fellowships in the American College of Dentists, American Academy of Oral Medicine and the American Association of Hospital Dentists. She is the immediate past president of the Special Care Dentistry Association as well as the current president of the American Academy of Oral Medicine. She lectures nationally and internationally as well as contributing to the dental and medical literature on the dental management of special needs and medically complex patients, managing the oral manifestation of systemic disease, HIV/AIDS, oral cancer and other oral medicine related topics. Dr. Hupp is currently an associate professor of Oral Medicine and member of the Department of General Dentistry and Oral Medicine at the University of Louisville, School of Dentistry (ULSD). Her duties include management of medically complex patients with the residents, dental and dental hygiene students, and lecturing to all levels from post-doctoral to freshmen. Dr. Hupp graduated from the University of Pennsylvania, School of Dental Medicine and practiced general dentistry in Wayne, Pennsylvania for nearly six years. She joined the U.S. Navy Dental Corps and was stationed with the Marines at Camp LeJeune during the first Gulf War, then received her residency training in Oral Diagnosis, Oral Medicine, and Oral and Maxillofacial Radiology at the Naval Postgraduate Dental School in Bethesda, Maryland. Dr. Hupp is a Diplomate of the American Board of Oral Medicine and moved to the ULSD Faculty in July 2007. She lectures nationally on the treatment of medically complex patients, pharmacology, HIV/AIDS, clinical oral pathology, and women’s health. Dr. Patton is Professor and Chair of the Department of Dental Ecology at the University of North Carolina. Her primary teaching responsibility is in the General Practice Residency program and training dental students who rotate through the UNC Hospitals Dental Clinic and operating rooms. Her special clinical interests are in the management of special needs and medically complex dental patients and diagnosing and managing oral manifestations of systemic disease. Dr. Patton is an accomplished investigator, author, lecturer, consultant, and editor. She is a Diplomate and past President of the American Board of Oral Medicine and a Diplomate of the American Board of Special Care Dentistry. She is a Fellow of the International College of Dentists and of the American Association of Hospital Dentists, and was awarded a Fellowship in Dental Surgery from the Royal College of Surgeons of Edinburgh. Dr. Pinto is founding Chair and Professor of Oral and Maxillofacial Medicine in the Department of Oral and Maxillofacial Medicine and Diagnostic Sciences at Case Western Reserve University, School of Dental Medicine in Cleveland, Ohio. 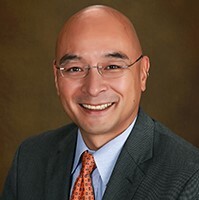 In addition, he is an attending staff in the Department of Surgery, Divisions of Oral and Maxillofacial Surgery and Pediatric Dentistry at University Hospitals Case Medical Center and Rainbow Babies and Children’s Hospital, and the director of the Oral Medicine Fellowship program and the MScD in Oral Medicine graduate program. He received his DMD, MPH, MSCE, certificate in Clinical Research, and certificate in Oral Medicine, from the University of Pennsylvania, School of Dental Medicine and School of Medicine. Dr. Pinto is a diplomat of the American Board of Oral Medicine and the European Association of Oral Medicine, and holds a FDS from the Royal College of Surgeons (Edinburgh). He was a member of the faculty and director of Oral Medicine Services at the University of Pennsylvania for 13 years, and during 2011-2013 he was the Chief of the Division of Community Oral Health at Penn. He has published extensively and is a coauthor of several major texts in Oral Medicine, like Burket’s Oral Medicine, Dental Clinical Advisor, and Curbside Consultation in Pediatrics. He is co-editor of Risk Assessment and Oral Diagnostics in Clinical Dentistry, a popular reference book for dental students and residents in General Practice and Oral Medicine training. He maintains a busy referral practice in Oral Medicine and Orofacial Pain at UH Case Medical Center. His clinical interests are the management of oral mucosal disease, oral oncology, pediatric oral medicine and orofacial pain. He has been funded by the Robert Wood Johnson Foundation, HRSA, and is a co-investigator in several NIH and industry funded trials. Dr. Treister is Chief of the Divisions of Oral Medicine and Dentistry at Brigham and Women’s Hospital and Dana-Farber Cancer Institute in Boston, Massachusetts. Dr. Treister earned his DMD from the University of Pennsylvania School of Dental Medicine and subsequently completed his Oral Medicine certificate and Oral Biology doctoral training at the Harvard School of Dental Medicine, where he is an Assistant Professor of Oral Medicine in the Department of Oral Medicine, Infection and Immunity. He is board certified in Oral Medicine and practices at Brigham and Women’s Hospital and Dana-Farber Cancer Institute with special interest in oral mucosal diseases, salivary gland diseases, and oral complications in cancer patients. He has published extensively in the field of oral medicine with an emphasis on oral complications of hematopoietic cell transplantation and chronic graft-versus-host disease. He currently serves as Study Chair for Children’s Oncology Group study ACCL1031 entitled “A Randomized Double Blinded Trial of Topical Caphosol to Prevent Oral Mucositis in Children Undergoing Hematopoietic Stem Cell Transplantation”, and as site Principal Investigator for ORARAD, an NIDCR sponsored study investigating the late effects of head and neck radiation therapy on oral health outcomes. 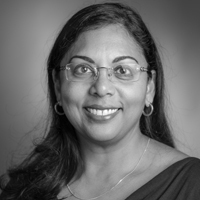 Dr. Sankar is an associate surgeon at the Division of Oral Medicine Clinic and Dentistry at Brigham and Women's Hospital. She is a diplomate of the American Academy of Oral Medicine. She received her DMD from the University of Medicine and Dentistry of New Jersey, earned her Certificate in Oral Medicine from the National Institutes of Health (NIH)/ National Institute of Dental and Craniofacial Research (NIDCR), Bethesda, Maryland, received her Masters in Health Science degree from Duke University and is a Fellow of the Royal College of Surgeons of Edinburgh.